I recently paid a little visit to Creek Park in Dubai. 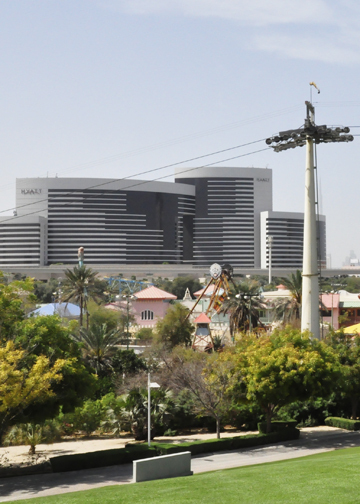 I think it is the only park in town I hadn’t been to yet and a shame because the views of and around Dubai Creek are my favorite in town. I much prefer the older skylines and buildings from Bur Dubai and Deira than the newer stuff that is constantly being built off of Sheikh Zayed Road and in the Marina. The new stuff may have some interesting architecture, but I don’t think it really has any personality or life to it. This little park visit may well be one of my last – if not the last – outings under the sun for quite some time. The temperatures in Dubai have been quite on the rise lately. We always seem to go straight from winter to summer here. No spring with a gradual climate change. One day it’s a balmy (for Dubai) 80 degrees and no humidity, then you wake up one morning and suddenly it’s hitting the 90’s with soggy, gross, humidity permeating the air. And once that happens, there is no looking back. It’s just going to keep getting hotter until we begin to cool back down in late October. Walking around Creek Park this weekend, I quickly realized winter’s lovely climate has decided to leave us and likely would not be returning for many, many more months. The Dubai World Cup (horse race) is in about a week and a half. A really great time, but I do hope that, unlike last year, the temperatures stay out of the 100+ range.